Welcome to HIU’s Washington Education Center. Whether you are seeking to advance in your current career or make the move to a new profession, Hope has a tradition of Christ-centered degree programs that will help you follow your calling. Hope International University has partnered with the Everett University Center to provide our students in the Northwest with convenient, top-level educational opportunities. This partnership allows Hope to offer flexible degree programs that can be offered 100% online. We invite you to review the undergraduate and graduate programs that Hope offers. Be sure to check out the opportunities for transfer students if you are a current student or have previously earned credit. If you are ready to get started, we have start dates every five to eight weeks for most of our programs so you can start your degree now. Questions? We would enjoy chatting with you to answer any additional questions you may have. Call us at (888) 352-HOPE or email us at washington@hiu.edu. You can also join us for one of our upcoming information sessions. Are you currently enrolled at a WA Community College? Or do you previously earn credits outside of Washington that you would like to apply toward a degree? Hope welcomes students with previous educational experience and we work to apply your previous learning toward a degree from Hope! 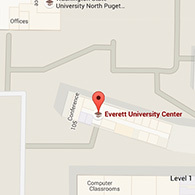 The Education Center for our Washington programs is located in the Everett University Center, 915 North Broadway Avenue, Office #309, Everett, WA 98201. Hope International University is excited to be involved with churches in the Northwest and integrating our unique educational opportunities with on-going and growing programs. Being a member of the Everett University Center allows Hope to provide excellent educational resources to our students living and working in the Northwest. Looking for more information? Feel free to reach out to our WA Programs Staff.